SAR022293 SCOTLAND (1954). Glasgow, WD and HO Wills Ltd Glasgow, Lanarkshire, Scotland. An oblique aerial photograph taken facing South/East. This image was marked by AeroPictorial Ltd for photo editing. Title [SAR022293] Glasgow, WD and HO Wills Ltd Glasgow, Lanarkshire, Scotland. An oblique aerial photograph taken facing South/East. This image was marked by AeroPictorial Ltd for photo editing. 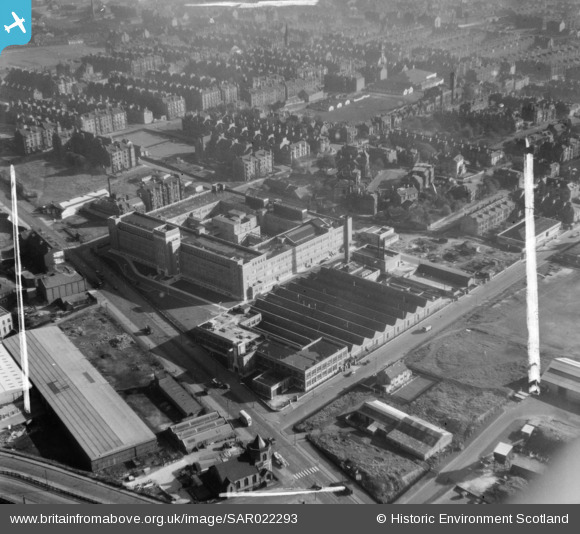 Dennistoun Baths opened in Craigpark in 1884 was privately run for members only until it closed in 1993. Apart from access to a swimming pool and Turkish Baths, members could also join various clubs which were affiliated to the baths, such as the harriers club (for cross-country running) or the water polo team. Glasgow’s Dennistoun Palais. The city venue, which had opened in 1922, was the biggest dance hall in Glasgow, with a capacity for 1800. It was said that 10 times round the dance floor represented a mile. In July 1966, the 'Denny Pally' announced plans to reduce its dance space to just a small basement, with a much larger area set aside for roller skating (The Rollerina). It was later turned into a supermarket, but there are now flats on the site.